Spa Bath 4 piece gift set. Beautifully wrapped in a window gift box with ribbon. 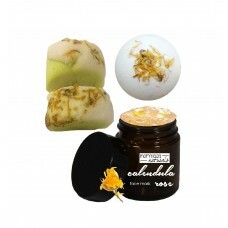 CALENDULA BUBBLE BARS-Solid Bubble Bath Bars. Crumble about 1/4 bar under running water for big bubble fun! Scented with Green Tea Cucumber fragrance oil. Ingredients: Baking Soda, Citric Acid, Sodium Isethionate, Sunflower Oil, Cream of Tarter, Vegetable Glycerin, Fragrance Oil (phthalate free), Color, Calendula Petals. CALENDULA ROSE FACE MASK- with anti-inflammatory and antioxidant properties for acne prone or aging skin types. Ingredients: Kaolin Clay, Distilled Water, Rosewater Hydrosol, Aloe Vera Gel, Calendula Oil, Calendula Petals, Vitamin E, Geranium Essential Oil, Eco Natural Broad Spectrum Preservative (Benzyl Alcohol, Salicylic Acid, Glycerin, and Sorbic Acid). Calendula is said to have antioxidant, antiseptic, anti-inflammatory and regenerating properties, and has soothing and skin softening properties. Rosewater helps to maintain your skin's pH balance. It helps fight acne, dermatitis and eczema. Rosewater hydrates, revitalizes and moisturizes the skin, and makes it smooth. Aloe Vera is well respected for its application as a moisturizing agent. It contains vitamin B complex, folic acid, vitamin C and carotene (a precursor of vitamin A). It prevents signs of aging by removing dead skin cells and improves the skins elasticity, has anti-inflammatory properties for healing, settles redness and is loaded with antioxidants. Geranium has antiseptic, astringent and balancing properties. It works to balance production of sebum (the skins natural oil) making it suitable for dry or oily skin. It also has wonderful skin repairing and preserving qualities. Kaolin Clay is the gentlest of all clays with oil absorbing and soothing properties. CALENDULA BATH BOMB-Ingredients: Sodium Bicarbonate, Citric Acid, Sea Salt, Jojoba Oil, Essential Oils, Dried Flower Buds. Contains Patchouli Essential Oil (antidepressant, deodorant, sedative, fungicide & anti-inflammatory. It also aids in reduction of cellulite. It helps stimulate renewal of skin cells, assist in healing rough, cracked skin, sores and wounds. It also has uplifting and calming properties that help control depression; anxiety and most stress related emotions). NO PARABENS, ALCOHOL, SULFATES, PHTHALATES, PETROLEUM DISTILLATES, PEGS, ARTIFICIAL COLOR, SILICONES, TRICLOSAN OR SYNTHETICS. VEGAN FRIENDLY OPTIONS. NEVER TESTED ON ANIMALS. JARS AND BOTTLES MAY VARY.